The Starr family lived in the cottage/first house behind no 29 High St, Harston. 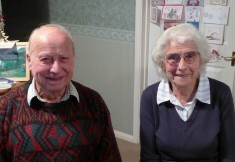 Joan was born there in 1928 but Jim was born in Cherry Hinton in 1931 where his aunt lived. The family then moved to no 8 New Rd (later renumbered 21 when more houses had been built). Their younger brother David was born there in 1944. The family house in New Rd housed their Thorn grandparents, parents and children. Joan’s grandparents died close to one another but Joan & husband Percy Bash lived there with her parents after her marriage in 1950. Then Jim left around 1956 to get married, then David. Later her dad, then mum died. 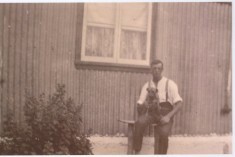 Percy worked on a farm in Sawston. Their father Charlie, his brother Tom, and sister Clara lived at Newton when young. Gran and Grandad Starr lived in a thatched cottage at Newton. Charlie did 7 years in the army. He and his brother ran away to join the army and went to several places including India. Before WW2 Charlie worked at Barrington Cement Works but then got his call up papers. The family went to Cambridge Station to see him off. Once during the war he was given compassionate leave to come home as his wife Rose was very ill. When Rose was young she lived at Barton Mills, then moved with her family to Cambridge. Her father, Mr Thorn, worked on the railways and was an engine driver but retired before the War, but during the War was a relief level crossing worker. He bought the New Road house when he retired. Charlie’s brother Tom worked on Hays Baggot Hall farm. A photo of Charlie Starr outside a tin hut in Sheepshead Lane was probably because his sister Nell lived there, before she and husband Arthur Northrop moved to Manor Close. They and son Fred lived next to Bill Long, Mr & Mrs Collins (Kath Rayner’s parents) and Mr & Mrs Payne. Jim also went to school with Barry Northrop, who with parents Les and Ivy lived near the beginning of Manor Close. Mr Northrop ran a paper round for a while but gave it up to work elsewhere. The 3 bedroomed house in New Rd was built in 1938 and had electricity, piped water and a toilet. However, there was a large tank on top of a large shed, attached to the back of the house, that collected rainwater, which was pumped into the house. There was a well at the back of each pair of the 8 original houses in New Road. Each house had a pump to pump the water in from the wells until the tanks inside overflowed, then they shut the pump down. Drainage of the surrounding land wasn’t very good and new Rd would flood at times, almost up to the houses. They did have a large garden which was full of vegetables, chickens and even rabbits. When rationing was on they had plenty to eat, although Joan remembers once going to the Old English Gentleman to get some butter when they had some in. Other families living at the end of New Road were the Knights, with son Trevor; the Haylocks with children Brian & Daphne; Mr & Mrs Lambert North; the Harvey family (originally owned by their sister’s family- the Blunts), and the Cooks and Impeys at no 1 and 2 respectively. Next to the Starrs in a bungalow were Mr & Mrs Ben Tweed, the latter a signalman on the railways, who had moved here from Newmarket. Behind them in a bungalow were Mr & Mrs Alice Whisken. An errand Jim did was take the accumulator (battery) to Ron Bass’s garage to be recharged. Jim and Joan went to the village school from 5-14 years of age. During the war Ms Jackson had the Primary Class (her sister was a hairdresser), The Headmaster Mr Royston had another, Mrs Richardson another and there was one other class. There was a woodwork teacher for the boys and cookery teacher for the girls who came once a week. The classes were quite large. Mr Royston used to send one boy out to collect the walnuts from his tree before letting the lads outside as his house and garden joined the school playground. Jim remembers an evacuee called Freddie Hollingsworth who was living in Newton, coming to Harston school. There was also a young lad living wth Mrs Knights. They all integrated quite well although a lot of evacuees didn’t stay long. Jim remembers passing the Tea room next to the 3 Horseshoes on the way to school- but can’t remember when it disappeared- was before he left Harston in 1956. Jim played tennis on the courts behind the village hall until about 1958- even returning to play after he left Harston. He thinks play died out not long after that so when they wanted to sell the land the courts were on for a telephone exchange there was little opposition. He cannot remember a bowling green there. He also remembers there being a fair around The Green but this , he thinks, died out with world War 2. Jim attended the Youth Club in the Village Hall in the 1950s. The youth leader used to come from Cambridge. He remembers Audrey Warren going ( Ray Warren’s younger sister)- she lived in a cottage to the right in Church St opposite the bakery. At the Youth Club they played board games, had dancing- a lady from Cambridge taught them ballroom dancing, and they had day trips out using Premier Travel coaches. Jim went to scouts. He recalls when they had to pretend to catch a spy and truss him up to stop him escaping- probably so they practised their knots. They had a campfire at Burnt Mill bridge and used Mr Crow’s meadow beyond the end of Button End. Where it curves round and you come to the river the young ones would go swimming. You could stand up in it easily at that point. Rivers were weeded and maintained then, with the edges cut. The river men worked full time on maintaining the river. At the end of the day when the rivermen had gone the boys would ‘borrow’ their punt. Wilf Collin’s dad used to work on the rivers and go beyond Harston but Jim didn’t know how far he went. Jim knew Brian Michelle in Scouts- his family used to live in Sheepshead Lane in the late 1930s & 40s. There was a very long lane back with a house at the end. Joan was in the Guides. The guides met at Fountain Farm/Cottage in the early 1940s in the barn/big shed. They would learn knots and entertain each other, and check they were presented smartly. Before she was married Joan worked in Cambridge, first as a machinist down Eden Street making little boys suits, then at Addenbrookes old site, then at the new hospital in the Laundry. She cycled to work but on dark nights her dad would meet her at the Old English Gentleman. 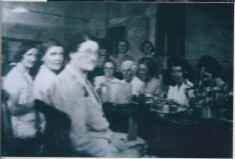 Joan had also worked at the Pye unit in the Harston Baptist schoolroom, which was there 1939-45. In the Pye photograph Joan is second from the right, and she also remembered second from left was Mrs Thompson (of Trigg Farm), and third from left was Mrs Neaves. Pye were also in the Oddfellows Hall. Joan’s dad would go there to pay money into the Forresters- a type of medical insurance. Jim also worked in Cambridge and cycled there and back each day, and often back in and out again to play Cricket on Parker’s Piece. He didn’t play for Harston, although prior to the war cricket was very good in Harston, and started up again after the war. Ted Law, a tall fellow, and Jemmy Hume were both Harston cricketers. Although people were used to cycling everywhere there was the 108 bus service from Royston to Cambridge that went through Harston. Also people went on day trips using Premier Travel, who also ran normal services. During WW2 the military- British army- were stationed at the garage next to New Rd. On the right hand side of New Rd used to be a grass strip where the military parked their vehicles, and where Longs later parked their coaches. Behind the garage next to New Rd, Pyes had an outbuilding carrying out war work. After the war an ex RAF officer called Wilds took over the garage for a while but didn’t seem very successful. The Sabbertons took over the garage after 1956. In the middle of Queen’s Close, marked as allotments on 1971 map, was a meadow where there was a search light. To the right and slightly south of this was a pill box which was later demolished. Near London Rd were huts. South of Manor Close and the council houses there was army stationed in a house – Pinehurst. There were many different detachments in Harston, often for a few weeks, including the Poles for a while. As you entered the Drift there was a hut to the right- the guard post and to the left was the latrines. Jim can remember that around 1944 the military put stars on their vehicles in preparation for the D Day landings. 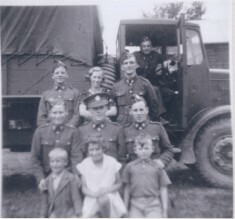 Jim, Joan and Trevor Knights (who also lived in New Road) are in the photo with the soldiers at Queens Close. The soldiers used to go over to the Starr’s house for their baths once a week. They used to give Jim rides in their lorries and even took him on their exercises. Once they went to Shepreth to practice blowing up a chimney at the old cement works. It took them three attempts- they weren’t very good at it and when they did blow it up bricks were flying everywhere and very close to where Jim stood. One photo with a single soldier in front of a tent Jim thinks was called Blackman and once his sister came to stay at the Starr’s to give her a break from the terrible times they were having in London. A photo with one serviceman with Jim, he thinks, was called Glen. Jim remembers rushing out of school at 12 o’clock along with the other lads to see the plane that had crashed near the Foxton Rd about half an hour earlier. All pupils went home to lunch in those days. He recalls his Uncle Ernie (Thorne) was in the Homeguard. During the War to the right of Willers Yard there was an area of land for the collection of any old tins and scrap metal which would pile up until it was collected for the ‘War effort’. They also collected all the waste paper for the same reason to recycle it. It was collected in a two storey building in Green Man Lane set back behind the Oddfellows Hall and parallel to the High St. Rosehips were also collected locally and taken to the school where they were made into rosehip syrup for the clinics to give to children. One day Jim’s grandfather who worked on the railways gave him a tip-off to go to Harston Station at a certain time and there he saw King George VI get off the train on his way to inspect the troops at Newton. Where Dr Young’s house (Bath House) was you could get water from a pipe in front by the ditch, although someone in the house could turn off the supply. Standpipes were also introduced at various points in the village. Mr Mallows had a cobblers hut/shop in the garden of Victoria Cottages, although he lived in Hauxton. His daughter Ruth came to Harston school when she was 11 as did all Hauxton children. Mr Turner was living at the Old English Gentleman during and after the war, but later moved to a wooden bungalow in Station Rd on the glasshouse side. 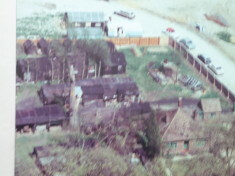 The Beaselys lived at the last building on the left (Byways) where Albert & Peggy Dainton later lived. Mr Beasley was an insurance agent. Ellis’s butchers shop was where the village stores now is and when Jim went to school the cut off corner was more noticeable than it is now. At the same time Joan remembers going to Goode’s Post Office on the other side of the road at no 53 High St. You entered by the side porch and went into a small well laid out room that sold stamps, and maybe postcards. At no 51 High St was an antique shop, which later sold vegetables. Aubrey Northrop’s haberdashery shop was in a wooden building separate from and to the right of the grocery shop (no 29) High St. run by Ayres. Andraea’s wooden shop at the top of Chapel Lane by his nursery sold mainly soft drinks, tea, sugar, and papers and cigarettes. He had glasshouses nearby providing flowers and bouquets. He built houses for himself and a bungalow for his son, thinking he would take over the business, but he didn’t. Near the beginning of Button End was a small shop at the side of a house called, Joan thinks, Lou Lous. It sold all sorts of things and odd bits, saving you having to go and shop elsewhere. In no 1 Church St the Harrisons ran the bakers, with the grocery in front of it. Vic Lawrance the blacksmith was deaf but good to the boys even though they ? Charlie Rogers lived at the Mill on Newton Hill and would cycle round the village on his bike carrying two large milk cans and jugs, hanging from a yoke on his shoulders. He would use the jugs to measure out fresh milk to his customers he called on. He later got a horse and cart to help with deliveries. On Newton Hill there were a number of poultry farm that sold eggs, as well as Thompsons where Joan’s brother David now lives. They also kept chickens near no 5-7 Royston Road where you could buy eggs. Mr Swan had a smallholding that would produce vegetables/fruit to sell. He also had a pony and trailer and, acting as a carrier, would collect everyone else’s produce and take it to Cambridge market and sell it for them. People would then go and collect their money from him. He lived at no 47 High St, a house at right angles to the road. His daughter Peggy & husband Vic Clarke had two children- Davison and his sister who sadly got run over.